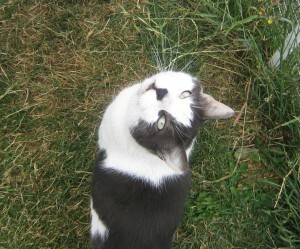 Please help Mau – the cat who dances with chickens. I realize this isn’t horror related, but we return to the previously scheduled horror shortly. PLEASE HELP: Mau is a beautiful 8 year old tuxedo cat. He is with his forever home, and he is loved. When Mau’s human first met him, he had a back injury and did not have full control of his back legs. Although he eventually healed, and spent 7 years in good health, recently he experienced a serious, life threatening digestive tract issue and his people – my friend Jody – went into DEBT to help her precious boy. Now we are raising funds to try to pay for his vet bill: we needed to raise $400, but only raised $25 so far and yes, that was from me. Please please PLEASE help Jody and Mau! Even if you can only give $5. How can you resist that adorable face? And please repost this. Here is a link to Mau’s story and where you can donate. Thank you. ~ by Sumiko Saulson on August 7, 2012.